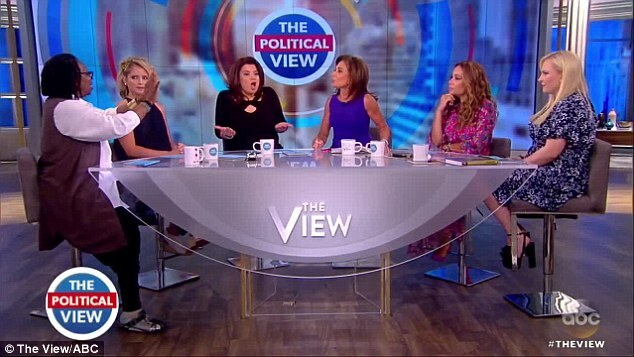 Looney Democrat plantation promoter and former actress, Whoopi Goldberg, who sits on ‘The View’ and runs her mouth, emphasising leftist ignorance and Hollywood Trump bashing vitriol, intended for the consumption of an equally moronic audience, just got served by Judge Jeanine Pirro when she appeared on the show yesterday to promote her new book, ‘Liars, Leakers and Liberals’. Nice! Whoopi Goldberg, who one might be able to say is a low IQ individual, started it off with her “muh Russia” schtick, complaining about Donald Trump meeting Vladimir Putin in Helsinki on Monday, trying to push the lies of the Russian collusion over the 2016 election results again, which as we all know, is just a cover up of the Democrat corruption with the Uranium One deal, and far worse from leftists, such as the fake dossier by the DNC, and whatever other lies ‘The View’ tried to come up with, such as blaming Republicans. Peter Strzok’s corruption within the FBI and CIA was also touched upon by Pirro, but sadly, his actions were backed up by the numpty talking heads of Whoopi and the others on ‘The View’, which got more and more heated as it continued. Whoopi Goldberg says “let’s not talk over each other”, however, Whoopi is the queen of talking over people, and she likes to take the moral high ground when she’s losing a debate that is backed up by facts from her opponent, just like all clueless liberals eventually do. Then Whoopi Goldberg started yelling and lost her cool at Pirro, like a deranged woman that’s absolutely clueless, warped and hysterical, which resulted in her kicking Judge Jeanine Pirro off the show. It is quite clear that Whoopi Goldberg suffers from Trump Derangement Syndrome, especially when she couldn’t and wouldn’t listen to the absolute facts that Judge Jeanine Pirro was providing for her earlier questions. ‘The View’ is the liberal mouthpiece for women, that solidifies the lies and hateful Trump narrative of the mainstream media, which fails to consider the ongoing struggle between American Patriots and the Deep State, right Whoopi? Here’s the full blow-by-blow of Whoopi Goldberg’s on air meltdown on ‘The View’, proving that she has clinical Trump Derangement Syndrome. You’ll be happy to know that you can watch the whole thing go down in the video down below in its full TDS exposé. It’s a must watch, people, so please enjoy! Judge Jeanine Pirro clearly won on The View! Buy ‘Liars, Leakers and Liberals‘ here!